Romans is a theologically rich epistle written by Paul filled with gems of pure gospel, written to the Roman church at a time when there was cultural awkwardness between the Jews and the Romans/Gentiles in the city. The Jews had just returned to the city upon the death of Claudius after an exile that spanned about 5 years, and while the Roman Church had been a purely Gentile church in those years, at the time of the letter, they had to accommodate the Jews back into the Church. Romans 8 has been lauded by some as the Great Eight, a book that explains our freedom from sin and extols the extent of God’s love for us to which no power in the world can oppose. Romans 8:1 concludes the discourse in Romans 7 on law, and gives us a great hope – where law condemns, the gospel serves not to condemn. There is now no condemnation for those who are in Christ Jesus – this is the essence of Christianity. In this study we will look into the element of time in this verse and the key that triggered the change from condemnation to no condemnation. now – I believe this is a crucial term in the midst of this great verse which many often overlook. Of course, the subject of the verse lies elsewhere in other phrases like ‘no condemnation’ or ‘Christ Jesus’, but allow me to spend a little time pondering over the significance of this word. ‘Now’ is a term that is governed by time, and the result of having this term in the verse means that it hasn’t been always. Consider these other phrases: ‘Therefore, there is always no condemnation…’ and ‘Therefore, there has never been condemnation…’ – when you put in Christ Jesus at the end of the phrases, these phrases might even be valid, but there is a difference in connotation between these phrases and the actual one. ‘Now’, suggests that sometime before, there was condemnation. And this term ‘now’ doesn’t deny that in the future, there wouldn’t be condemnation. But when ‘now’ still exists, the following phrase is valid: ‘there is no condemnation for those who are in Christ Jesus’. The question is, when is this ‘now’? When Paul said it during his time, that was ‘now’. And in the study of this verse, in order to believe that this verse stands true, the premise that we must accept is that despite two thousand years having passed, Paul’s ‘now’ still hold true for us. It hasn’t ended. Perhaps it will never end. But it is something we need to believe. for those who are in Christ Jesus – Are there any points that we can make to help assure us that this ‘now’ hasn’t ended? Oh, of course, and the key to this is the condition to which ‘no condemnation will hold true’. Paul didn’t make the mistake of saying that there will be no condemnation for everybody. He singled out the group of people clearly – those who are in Christ Jesus. Not those who believe that Christ Jesus exists. Those who are in Christ Jesus – those who follow him, obey his words, and carry out his commands. What is the significant thing that happened that shifted the spiritual climate during Paul’s time, that allowed the ‘now’ of Paul to begin? It is clear – Christ Jesus. Before that, because Christ Jesus wasn’t here, there could be no one who was in Christ Jesus, and hence, this verse would be invalid anyway. Before Christ Jesus, there was no bridge between men and God in the way that Christ Jesus acted – a redemptive bridge that cleanses us and brings us before the Lord. Because Christ came, and he died on the cross for us, there is now no condemnation for those who are in him. Christ Jesus did something the law couldn’t do – remove the condemnation from sinners. Why couldn’t the law do it? Because God condemned sinners, and that was very much in itself a law, a rule, a fact that couldn’t be bent. It was something that needed an extraordinary event to change. You see, at just the right time,when we were still powerless, Christ died for the ungodly [Rom 5:6]. For what the law was powerless to do because it was weakened by the flesh, God did by sending his own Son in the likeness of sinful flesh to be a sin offering. And so he condemned sin in the flesh, in order that the righteous requirement of the law might be fully met in us, who do not live according to the flesh but according to the Spirit [Rom 8:3-4]. no condemnation – it is clear that this means that we are free from the condemnation of sin, but it also encompasses many aspects of our lives that we may not naturally associate with sin. If we are in Christ Jesus, we are free from all condemnation – including the condemnation in physical pain or illnesses, the condemnation of academic or career failures, the condemnation of marriage difficulties and parenting troubles, the condemnation of being weak, being helpless, being confused, being inadequate. what God wants us to understand from Romans 8:1 when he says through the apostle Paul, “There is therefore now no condemnation for those who are in Christ Jesus,” is that all of God’s condemning wrath and all of his omnipotent opposition against us in our sin has been entirely replaced by almighty mercy and omnipotent assistance. In Christ Jesus God is always for you. Always! Instead of the anger of a condemning judge, God looks at our sins with the anger of a disciplining father. And when he disciplines us, or when we face sufferings and trials, we need to know that it isn’t a ‘condemn-you-to-the-depths-of-hell’ kind of punishment, but it is out of God’s love and mercy for us, either to discipline us to better ourselves through the adversary, or to spare us from the condemnation of the world. Some people quote this verse and run away happily with the idea that God forgives – no strings attached, no limits to the number of times – again and again and without any repercussions. 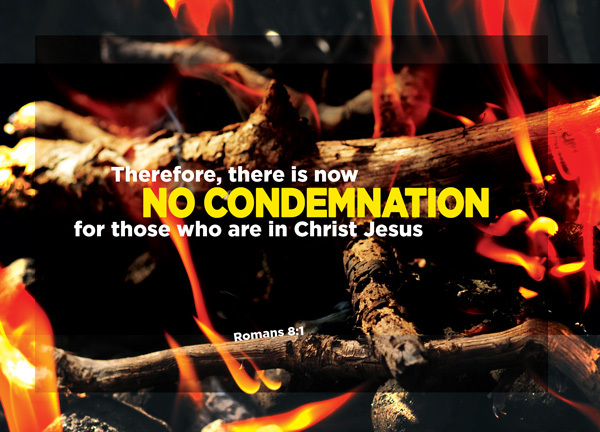 That is, to me, a misinterpretation of the phrase ‘no condemnation’. We still need to face up to our sins and learn from past mistakes, but we no longer need to dwell in past sins or be identified by our past mistakes. The key to this, however, is Christ Jesus. Even before considering condemnation, we need to be in Christ Jesus; then, we will be freed from the chains of condemnation. Let us not persecute ourselves any longer. Let us not live in guilt. Let us turn to Christ instead.